Anna Amadio creates drawings and inflatable objects. Literature, architecture, and imagery, oozing from every pore of our everyday existence and affecting us deeply, serve as a basis for what Amadio picks up, processes, and reinterprets in the steps she takes towards making an artwork. A thick pile of pictures — photographs, copies, or newspaper clippings — are the artist’s personal archive. What intrigues her about the pictures she collects is their inherent potential as stimuli, something that is capable of unleashing imaginative and dynamic forces. The works subsumed under the heading of “drawing” comprise classical pencil drawings, but also works made with crayons or felt-tip pens as well as frottages. The instruments she employs are templates or model sheets with glue drawings of selected motifs. In her most recent series of works Amadio resorts to a sequence of motifs arranged by herself; it features figures surrounded by numerous birds, one of them drenched in water. The connotations conjured up by the motif range from historical scenes of baptism to contemporary advertising where playing with water is translated into seduction. In the finished frottage the motif itself is only recognizable in details, as it served as an initial conceptual support from which emerged numerous processes. Amadio, for example, puts a sheet of paper on glue drawings and rubs the details of the motif with a set of crayons before turning to the next motif. “These are controlled as well as uncontrolled moments, there are confusing perspectives and inserted proliferations.” Concentric circles, proliferating lines, condensed areas and frayed parallel tracks — they all merge into a spatially bizarre microcosm. The vigorously performed work process does not preclude damages done to the surface, and these damages are seen as active signs. Amadio’s drawings are alive. They derive their vital quality from gaps opening up, nooks and crannies making escape seemingly impossible, curvatures set into motion, intertwined inner and outer zones, condensed “hideaways” used by our imagination. No other writer has ever captured the phenomenology of angles, curves, miniatures, as well as internal and external spaces as aptly as French philosopher and scientist Gaston Bachelard. His studies of the phenomena of poetic images, i.e. those images that appear in our consciousness “as direct products of the hearts and souls of humans in their immediate presence”, form a bridge that we can cross to grasp Amadio’s works. “He ‘listens attentively’ to the drawing, but there is a corner, a trap holding back the dreamer. […] And yet peace comes precisely to this prison. In these corners and angles the dreamer seems to become aware of the tranquility which mediates between being and non-being.” This description could be applied to the tensions and power inherent in Amadio’s drawings. As for the minute details to be observed in those drawings, Bachelard offers a phenomenological comment: “I own the world more if I am skillful enough to turn it into a miniature. But one has to acknowledge that in a miniature version values become more condensed and gain speed.” These details harbor whole worlds, depending on the reader’s talent and imagination. In Amadio’s drawings and frottages details open up the door that leads to the vast realm of imagination, giving recipients access to their own fantasy. Amadio’s large-format air structures made of polyethylene and PVC fill up space. 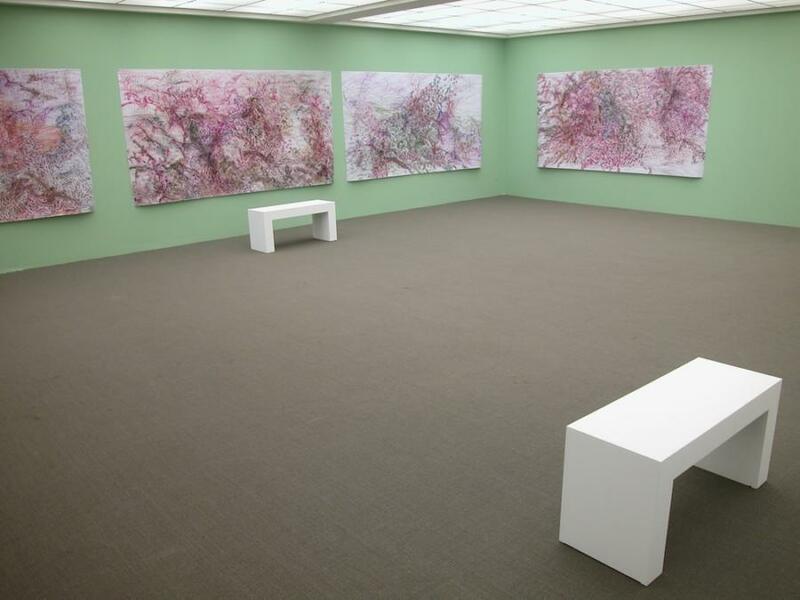 Says the artist: “They literally take away space and just stand around, devoid of any obvious function. They do not conceal anything, nobody hides in them, and they have no invisible chambers. They expose their entire manufacturing process — their welded seams lend themselves to discovery, there are no invisible suspensions or double bottoms. Not even the generator creating this space is hidden.” Despite the transparency of the material used, Anna Amadio’s inflatable objects are compellingly present because of their “pressurized state”. Viewers at first do not know what to make of them—they appear familiar and strange at the same time. The associations they trigger range from inflatable pieces of furniture to bold architectural models. The twists and turns of these object-like entities allow us to physically feel what drawings convey at an imaginary level. When the space surrounding us makes us taciturn, this is due to a spiritual opening which retracts into its existential being in the angles, corners, and turns of Amadio’s wondrous objects.